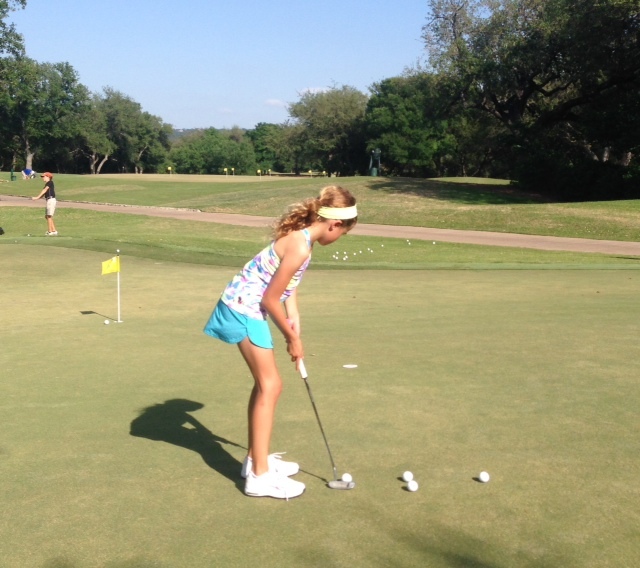 This past week, I created a “game” which ended up being very effective in teaching my daughter turning effective distance control and put some meaning to the “words” I was saying… she could effectively process the distance and hit great putts… let’s call it the Coaster Game. For downhill example – find a very steep putt on the putting green (ideally one that if you drop the ball, the ball will roll past the hole). Drop the ball to show the child where the ball goes if it barely rolls over the top of the hill. Put the coaster at this point and have them make strokes. For uphill example – find a uphill putt that requires the child to hit the ball with some pop (2X as hard as a flat putt). Ask your child, where you should put the coaster… ideally they will say 4-5 feet behind the hole. This Coaster game really started to click as my daughter started to find different places on the green (uphill and downhill) with the goal of placing the coaster in the right spot. Often times, she would hit her first putt… then go move the coaster to a better place. Net-Net… this was the first time she actually ever learned how to properly read a green… everything else had been by feel. This game provides “feel plus strategy”… which is a winning combination. A video of the drill would be great. I don’t think i have a video… but the goal of the drill is to find “the fall line”… where the ball will run straight down hill along the slope.